But somehow this city-girl, always got captivated by nature. Always! Nature never fails me. It is always breathtaking, and it always remind me to its Creator. And today i want to share to you this awesome place that captured my heart. Located at northwestern side of Slovenia, Bled town has attracting visitors from all around the world, All the more its Bled castle and Bled lake. History said that German Emperor, Henry II was giving a favour to the local Bishop. But the Bishop thinks that the castle is too fancy for him to stay in. Since then, so many owners come and go, was Brixen administrative building once as well. So the castle itself changes a lot too in terms of their architecture. I myself don’t really understand buildings, but this oldest castle in Slovenia is just pretty and worth the visit. Why though? Because it is seated just next to the beautiful Bled lakes, surrounded with big mountains decorated with a pretty little island church in the middle. Beautiful, isn’t it?? I can stop and stare for a long whilee.. and right after visiting the Bled castle, we took our bus tour to visit that pretty tiny island church. Once we arrived at that little island, we have to take 99 steps up to the church up there. History said that long long time ago there was this rich couple who lived in Bled castle. Then the husband died when he was travelling. To keep the memory of her loving husband, the wife wants to build a bell tower. But apparently after two times of sending, the bell always failed to reach the island. She finally decided to built a church to commemorate her husband. Until the local Bishop heard about this story, and try to send the bell for the her husband for the third time. Now, this place is a busy place for local couple to take pre-wed and have a wedding in this island. Well, i cant see why not. Since it’s indeed pretty in here. My parents kept asking me and my brother to go for this Balkan trip. And we finally agreed to go in March, when the period is already heaten up a bit. Well, if you try to google, the best time to visit Balkan countries (southeast of Europe) is during the Spring time, which is in April/May. But since we have to go for a tour, there’s not much options on the travelling dates. Anyway, the very first day of the Tour is super interesting for me. We went to Postojna (read: postonyah) cave , the billion years old cave that was just discovered 200 years ago by a cave lamplighter assistent, Luca čeč. The cave itself is super huge, it is stated that it’s the only cave in the world that have a double track railway line! Yes, it’s the very first time for me as well to enter this kind of cave with a train (you can see my IG for reference🙈) , and it’s quite an interesting experience too to travel the first 3,7km with it. It feels like you’re in some kind of rides in universal studio. Haha. *Thanks to the imperial couple Franz Joseph and Elizabeth, who came to visit for the first time, and the people got it set up for them to enjoy the cave. Since then, the train tide has always been revamped for the visitors to enjoy the ‘show’. i’ve been to this kind of cave in Hanoi (Thien Chung Cave) and China (Guilin, Reed Flute Cave – this one is pretty amazing too) but nothing like this before. Maybe it’s size captivates me. I think the size of the cave is 70 metres high, with more than 24km long. But yesterday, we only walked about 2,5km. Which is the normal package of the attractions. Maybe the other 19km is not explorable for the visitors. You have to enter this cave guided by the provided tour guide, and in designated time. So if you’re late, you have to wait for the next timing. They have many languages too. But mostly are still in english and european language. The stalactites and stalagmites are so amazing. I can’t stop staring at some of them. Moreover when i know that it takes 10,000 freaking years to only grow a metre of it. It’s just Mindblowing! Btw it’s cold and quite damp inside, so make sure you bring a jacket and wear comfortable shoes to walk that 2,5km of awesomeness. And dong forget to see blind Salamander aquarium right at the end of the walk. They said that Postojna blind salamander lives in total darkness in the Postojna cavern complex. They can grow to up to a foot in length, making them the world’s largest cave-dwelling animals and they can live up to a century. There’s another funfact too why we cannot use flashlights inside the cave. Scientists said somehow our flash lights have some chemical reactions that somehow will stimulate algae to grow on the Karst. Surprise surprise! *amazing 5 metre Karst that is very iconic. The white one (right side) is made from pure limestone, whereby the red-brick one (left side) is made from limestone with a mixture of red soil. Interesting to see how a side by side thing can grow differently. Two weeks ago, i made another impromptu trip to Singapore to settle some stuff. Apparently this running errands to Singapore thingy is getting more frequent. Which sometimes it made me tired, but super happy at the same time. Anyway this cafe is called the ‘Early Bird’ cafe. A cafe that’s located one block away from Bugis MRT station and had a yellow popping colour that you will surely notice. This little nice cafe apparently is very comfortable for catching up, having a sip of afternoon coffee, even work remotely and gazing at the passersby one in a while. I personally love their simple decor, and not that noisy kinda area. Other than the ambiance, i think they have fascinating menu for brunch / dinner, and heard that the taste is not bad either. But since we already had our lunch, and we just want to hang out a while. We only ordered drinks and their truffle fries. I personally think they have a nice Truffle fries (SGD10), even though i somehow feel the one at PS cafe is nicer, or maybe smell nicer (read : more generous in their truffles oil) hehe. I ordered their mixed juice (SGD 7) since i wanted to drink healthier things now. The good thing is, all their juices are freshly made. My friend ordered their cold brewed sparkling tea (SGD 6.50) which come in a big bottle that taste weirdly nice for me. And my other friend ordered a glass of hot Mattcha Latte (SGD 5.50) that is really thick which i’m sure all green tea lovers will like it. I think it has been the fifth time that i visited Bali this year. Apparently Bali is very popular destination for every events, be it for international events to private ones, all the more for wedding celebrations. I know having a private party in Bali over the oceans or up on a cliff can be very beautiful, especially when the sun goes down and give pretty hues all over the skyline. But apparently having a destination wedding or business trip (as for me) is pretty tiring. The traffic that we have to go through, the waiting time at the airport, the flight itself, and the drive to our hotel can take a lot of energy. Even though what we do is only sitting quietly and probably just playing around with our gadget or reading some books. Nowadays, i’ve been looking for a spa anytime anywhere. Gosh.. Not sure if it’s the age issue or having a spa is always a good idea when you’re kinda tired. Haha.. not those only massage place, but those with nice scents, good scrub and flower bath. *pampering day mode on. Finally, after hosting a pretty wedding at Conrad, Nusa Dua, I decided to have my me time in this pretty space called Taman Air Spa. Was just googling around, and found this gem in Sunset area. Taman Air spa has a lovely interior design for a spa place. A space that’s designed rightly for resting and relaxing. The nice smell all over the place, friendly staffs, beautiful view, proper therapists and one more important thing, they have a very clean space! All of the above made my spa experience whole in Taman Air Spa. Not only that, after went to a few spa places jn Bali, i think Taman Air Spa has a good price too! I spent Rp 375.000 for 2 hours spa treatment that includes massage, body scrub, and flower bath. Oh, btw i think they have a different price between Indonesian / KITAS holder and foreigners. Don’t forget to check with them first. And oh, this is not an endorsement. Purely good place that i just want to share. Hey guys! I just got back from Korea, and gain 2 kg from my 10 days of trip. Gosh! *i am still in denial! I thought all the stairs i took in Korea train stations and all the walk will shed the calories, apparently my intake was still much higher than the output. 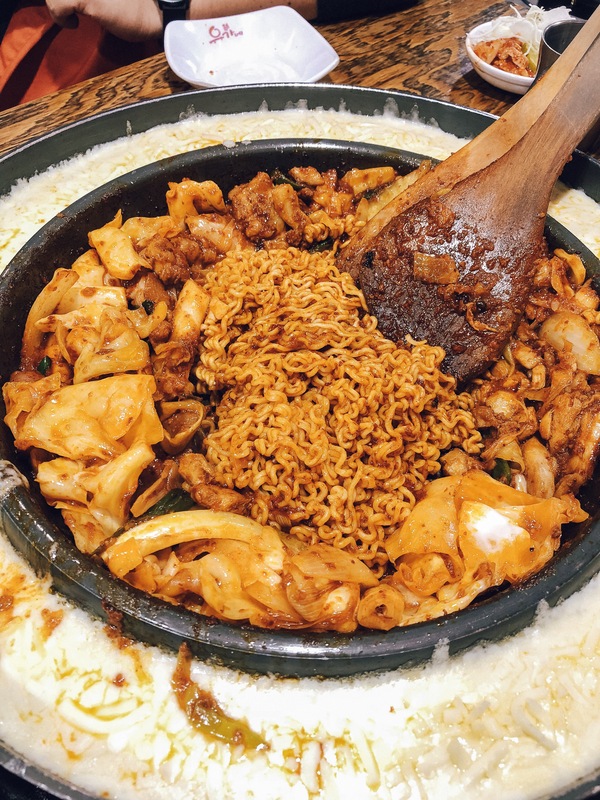 Haishh.. As i mentioned on my VLOG here, i did not expect much from Korea, since i’m not a K-Pop nor K-Drama fans, and not even a fan of bibimbap. Well, i can eat bibimbap, just not a fan of a bowl full of vegie. Haha. Even tough i don’t really like bibimbap, i like Korean BBQ! Well on additional note, i think i’m more to a BBQ person rather than a shabu-shabu person. 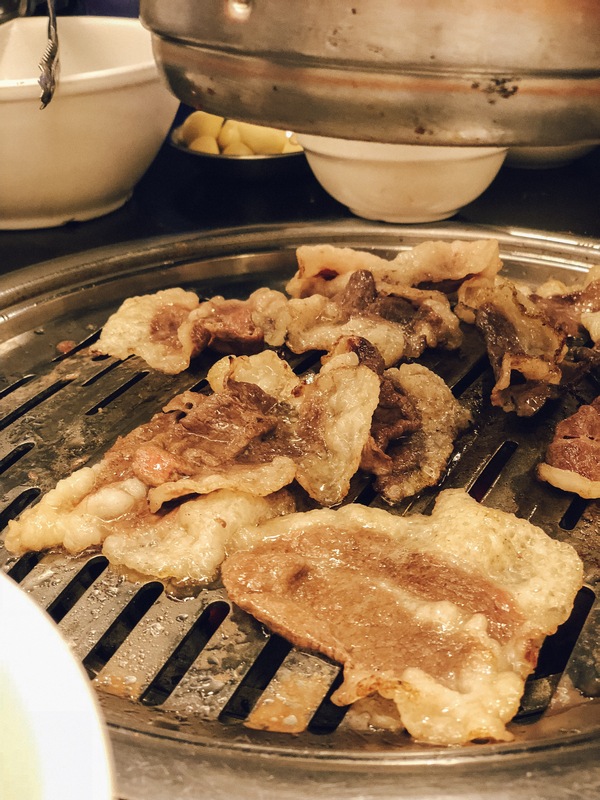 We tried one fancy korean bbq named TWO-PLUS KBBQ in Gangnam area before we went for this one. And apparently the fancier one is less nicer than this Saemaeul Sikdang. HAHA. Well, TWO-PLUS BBQ has a very nice aged tenderloin, but the beef tounge is such a flop. Saemaeul Sikdang can be called a house of pork, since they only served one kind of beef meat. And i have to say all the pork meat here are good! Or maybe i can say that they marinated all the meat nicely, so when you grill the meat, you can still taste the sweet tasty flavour out of that juicy meat. They give plenty for a portion as well, which can fulfil your hungry stomach that wont burn out your wallet. And of all doenjang-jjigae that i’ve tried, this place has the best soyabean paste stew so far. Haha.. It has salty and spicy flavour with tender tofu inside. It’s so my kind of soup. I learn that they have many outlets around seoul, but we went to their outlet near Sinchon station exit 3. *When you’re out from exit 3, take the second right, and you’ll see many shops on your right side. Just go straight a little bit, and take the first right turn rightaway, you’ll see this restaurant on your right side. 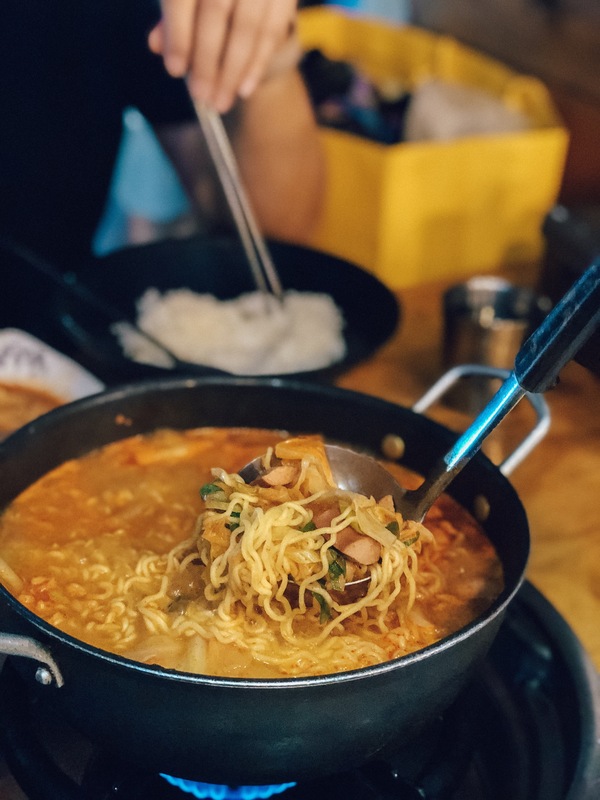 I remember i first tried an army stew or Budae Jjigae in a small korean stall in Dhoby Ghaut Cathay, Singapore. 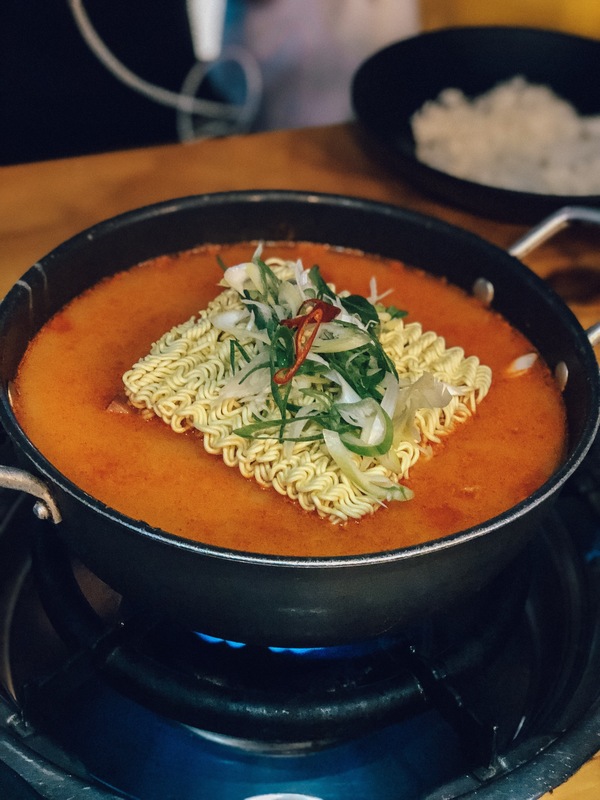 I still remember how it looks and taste like, a very nice korean hot pot with a lot of things inside, accompanied with nice soup and instant noodle. After trying a few army stew in Singapore, i always thought that the soup in an army stew, wouldn’t be that much. But apparently the one that i’ve tried in Sim Seun Tang, is a little bit different. The soup is so plenty, like you’re eating a bowl of ramen. Or Maybe it’s the way they have it here in Korea? Anyone wants to share? Anyway, this budae jjigae that i tried in Myeongdong area is so nice, love the spicy salty kinda tangy soup based. Guess all ingredients in army stew is the same everywhere else, whereby they put sausage, spam, kimchi, mushroom, ham, and instant noodles. So what makes the different is the soup based. and i think they have a nice soup to slurp during winter times. 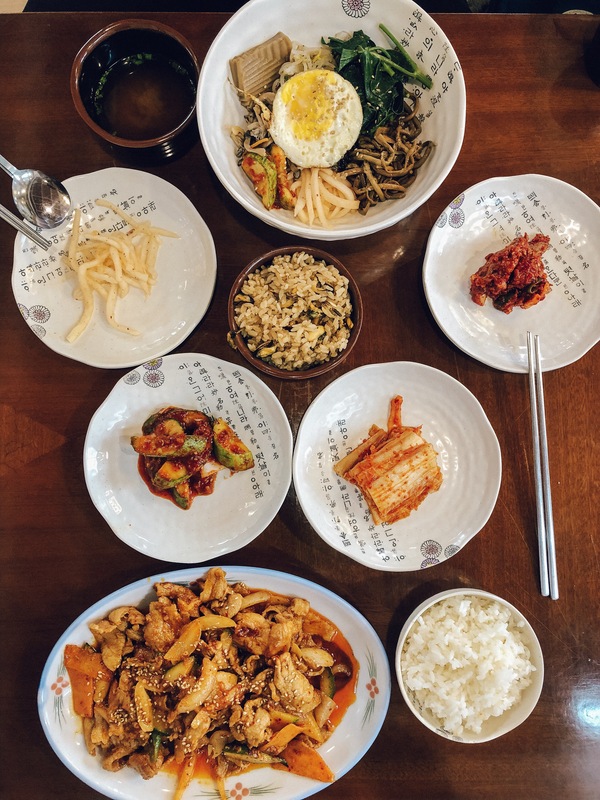 and if you like korean side-dishes, i have to say they have great side-dished too! love the salted fish and spicy fish-cakes. haha. 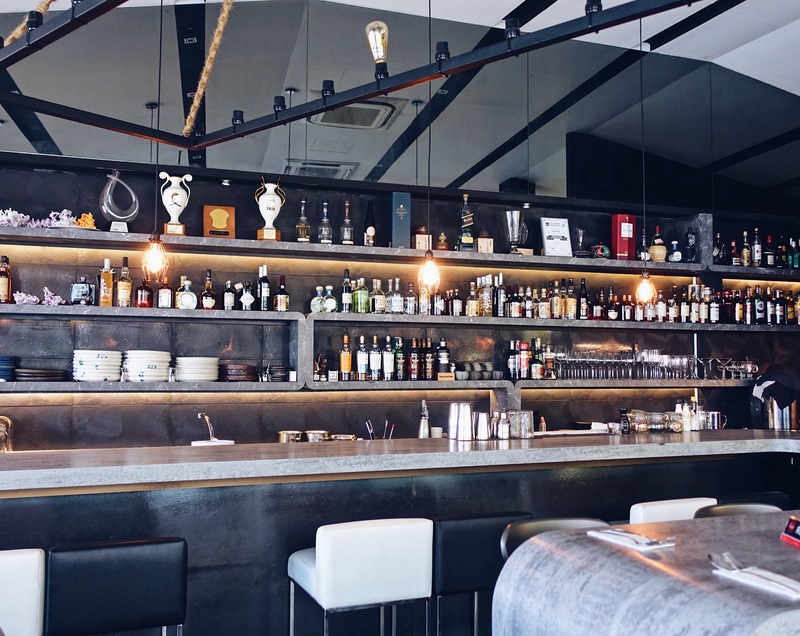 You can find this restaurant at the junction of Myeongdong area, just opposite Olive Young. Well, i know the direction dont help much. Haha.. Since myeongdong is full of labyrinth that i myself got confused, and they have a lot of Olive young as well. Anyway, if you see a rather big junction with Citibank and Olive young on the right, this Simpson Tang is on your left building, on the second floor. Sorry guys, but that’s all i can remember. Haha.. This is a super must try when you’re in Korea! I know they have the same Yoogane brand in Jakarta and Singapore, But you cant miss this one out. The spicy stir-fry chicken mixed with instant noodle is the best! and if you’re a cheese lover, order extra cheese on the side, and dip it with your spicy chicken! Trust me, it tastes like heaven! Haha. Well, not everything in Yoogane is spicy. So for you who cant take spicy food, you can order half-half with your friends. so, half side of the pan is pure stir-fry chicken, and the other side of the pan is like the pan full of spicy-goodness! You can choose your carbs, between rice, noodles, sticky noodles, or udon. Since all of us is instant noodle lover, we dont even think when we order the carbs. Instant noodle it is, where-ever we go. Haha.. Anyway, dont wear anything fancy if you’re planning to go to Yoogane Dak Galbi, cause you’ll be out smelly from head to toe. 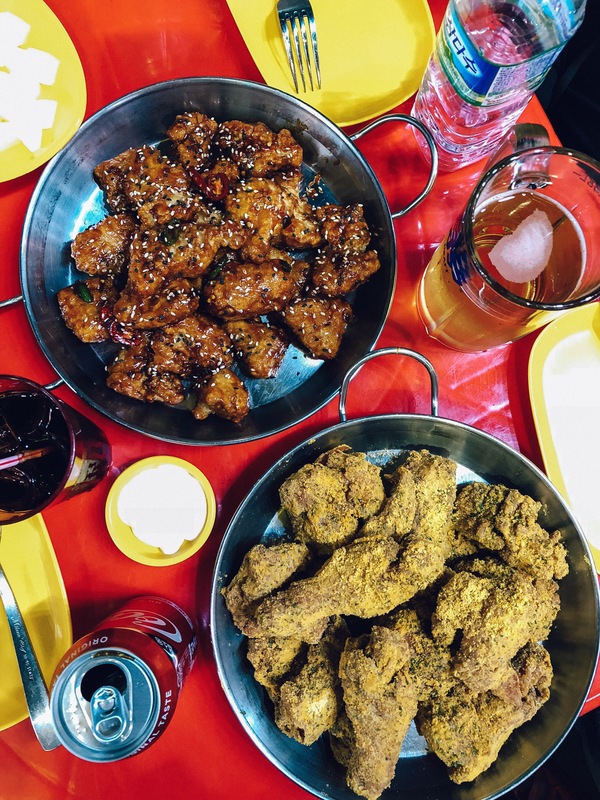 Was wondering around what to eat that night in Myeongdong area, and then my friend said that she wants chicken and beer. So we went to this area, where the whole stretch of the street is selling chicken and beer. We took a stroll, and looking around which one worth the try. Apparently they have Chir-Chir on that stretch too, but Super quite on that busy night compared to the other stalls. So we decided to pick the one with the most people, assuming that place should be nice. and we cannot be more right, BHC is hands-down the best fried chicken after KFC. They have crispy skin outside with the tender juicy chicken inside. And the Sprinkle Chicken flavour is the best! More over if you like salty cheese sprinkle mixed with onion and garlic. Best topping ever! We just found out that BHC Chicken is a fast food chain in Korea. Trust me, i dont google anything of these beforehand. haha.. I guess, this is the most unprepared trip yet very enjoyable one. Anyway, let’s continue, BHC also have a wide range of flavour to choose from, from just a normal fried chicken, salty, sweet, until the very hot one. You just have to choose which one that you feel like pairing with your full pint of beer! This is another random restaurant that we entered, right after we stroll around Bukchon Hanok Village with our Hanbok. And we are so grateful that we found a gem in the midst of all nice-looking cafes in that area. My friend ordered mussels bibimbap, and i ordered spicy bbq pork. My friend said she likes the mussels bibimbap so much, and all the side-dishes. Since im not a seafood lover, i dont like this bibimbap at all. And apparently they are very famous for their mussels bibimbap and mussel rice. 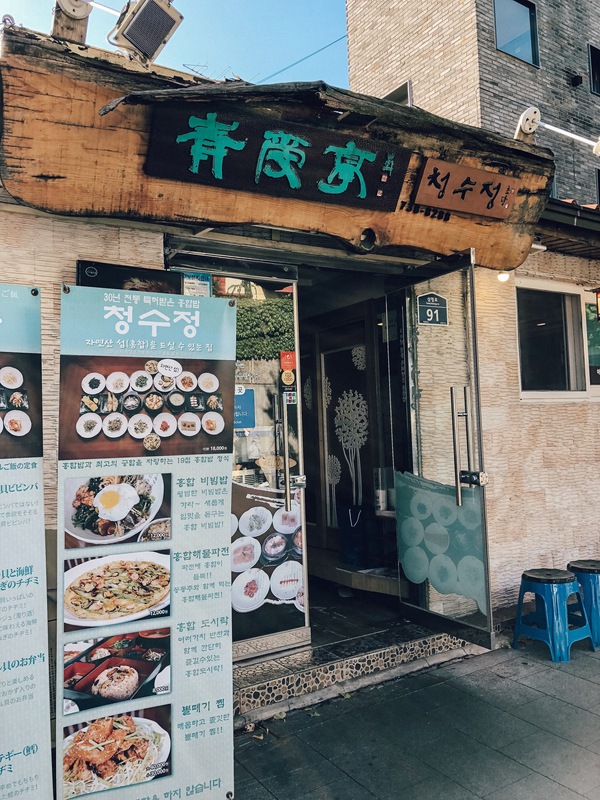 So if you are a mussel lover, guess you should try out this restaurant when you visit Hanok Village. On the lighter note, i love their spicy bbq pork so much! They serve in a very big portion that myself cant finished it at all. luckily my friend helped to eat as well, else i feel so bad to waste such a good food. 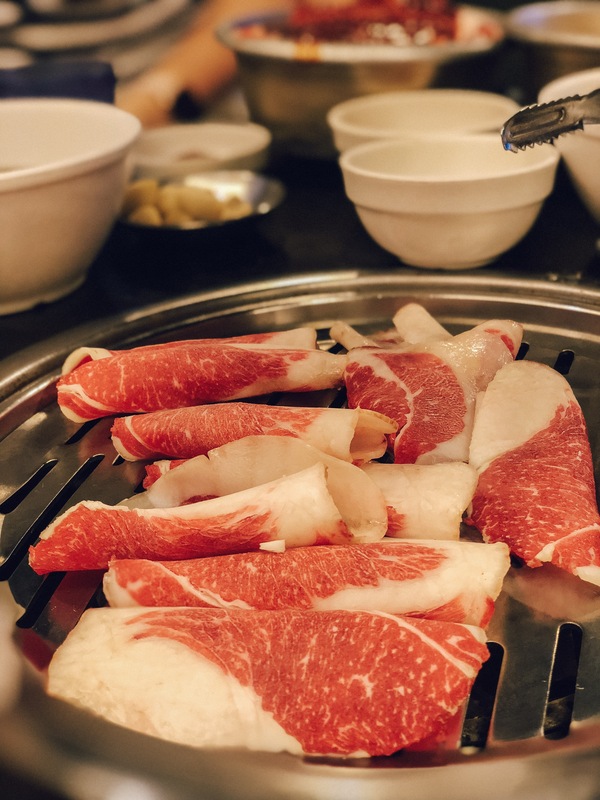 Love the juiciness of the meat, and the sweet-spicy seasoning! Best spicy-pork bbq so far! Super recommended if you’re around. 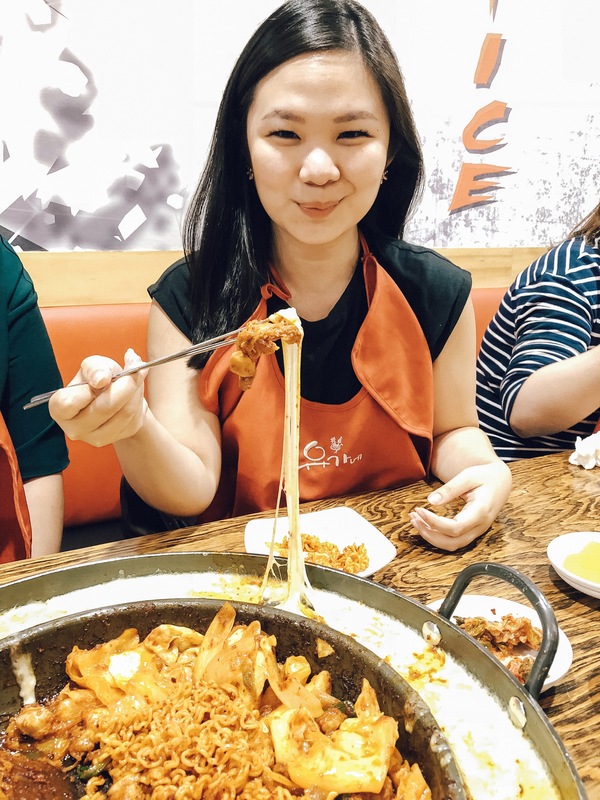 Hope this blog helps when you travel to Seoul! Bali always have something new to offer. Sometimes too many new stuffs coming out together that made you confuse on which one to try first. Luckily i have some friends who are staying in this lovely island now, that makes it easier to find good new places to eat and hangout. When i reached Bali, it was almost 12 o clock in the afternoon. And since me and my friends haven’t had our breakfast yet, We were starving like crazy. So I contacted a good ‘cici’ of mine to recommend what’s good for lunch for 6 hungry people. And she told us to go for Pork Star Restaurant in Seminyak area. Pork Star is relatively not new though, Since it’s been around there for about 2 years. To be honest, this place is Quite easy to miss out, cause they have a small entrance. So my advise is, drive slowly when you are close by. 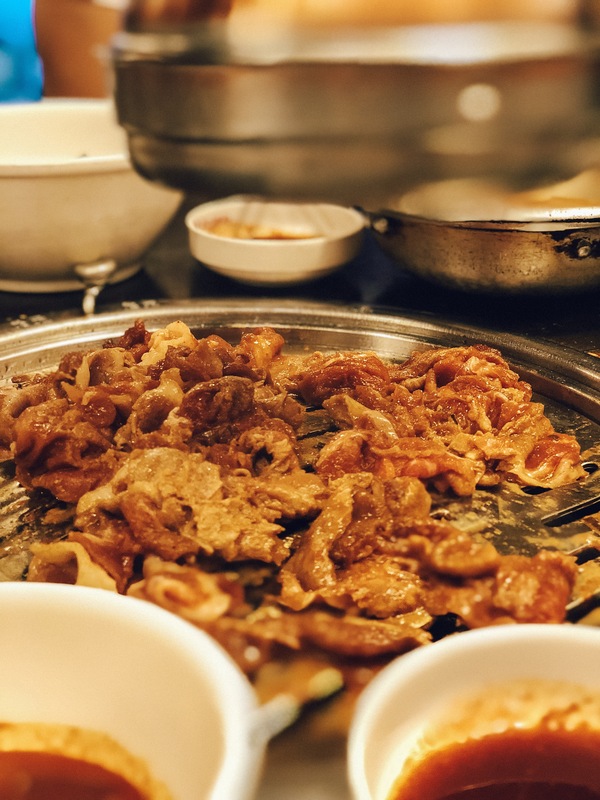 I know this sounds a little bit weird, since i’m sure many of us are more familiar with beef tongue. Well, it tastes like a beef tongue for me, only a bit more firm and thicker. They claimed that they boiled their pork tongue for 6 hours, so it’s kinda tender and easy to eat. I love the sambal hijau or green chili, not that spicy (at least for me) and it goes right with the boiled pork. Maybe my suggestion will be, to just order a plain steamed rice, rather than the butter rice. The butter rice is not bad, but it is just overwhelming for me to mix strong flavor with another strong taste. Juicy and Tender meat, something that is very safe to order if you don’t really like Indonesian spices. 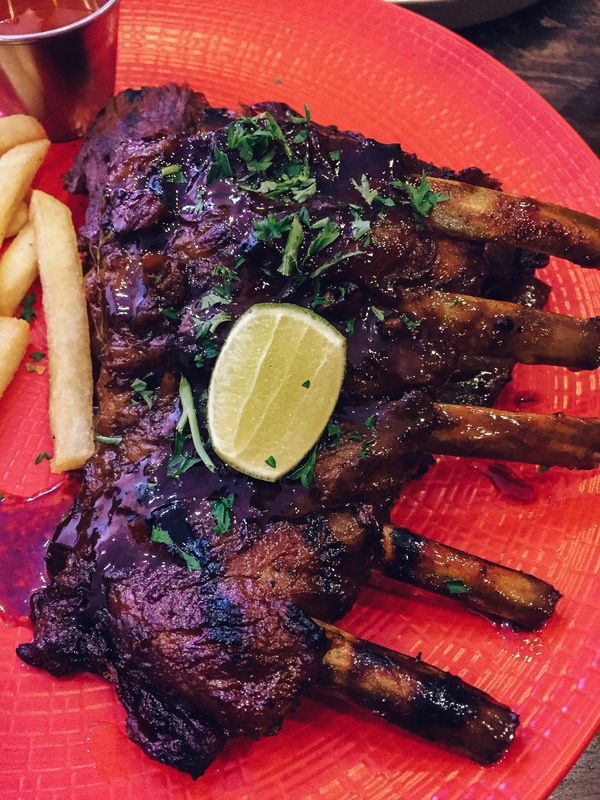 I felt the sauce is too sweet for a pork ribs, but for you who love sweet food, it can be your favorite meal over there! This meal is accompanied with french fries too, which i think it can help you to neutralize the sweet hongkong style sauce. This is not your typical Bali Nasi Campur, where you have suckling pig set and pork satay. 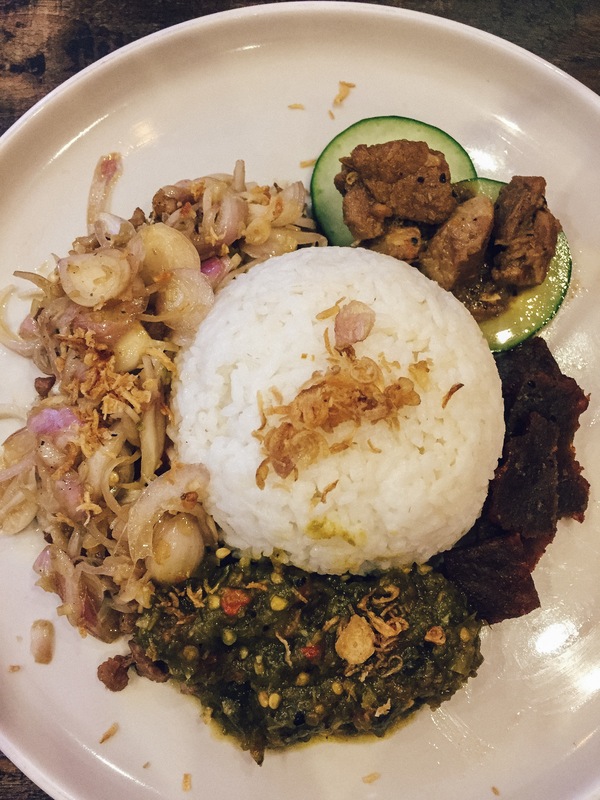 This Nasi campur consist of 4 pork goodness, which is Babi Sambal Matah, Babi Sambal Hijau, Babi Rica-rica and Dendeng that comes with steamed rice. All are good, they cooked the pork well, but my favorite is the Dendeng and sambal hijau. 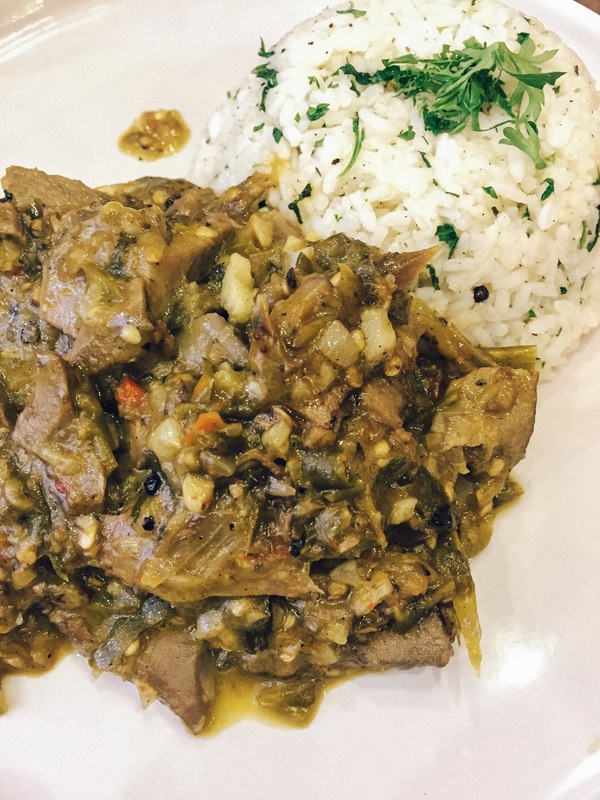 The Dendeng or dried pork is very savoury and the sambal hijau is just so good. Guess i just love green chili. haha. I have to say they have the most random menu. From local pork delicacies to pork ribs, and now pasta. haha. Since there’s a friend of ours who doesn’t eat pork, so she ordered this mushroom pasta with creamy truffle mushroom choice. I thought the pasta will be a bit off. But truth to be told, this pasta is so good! 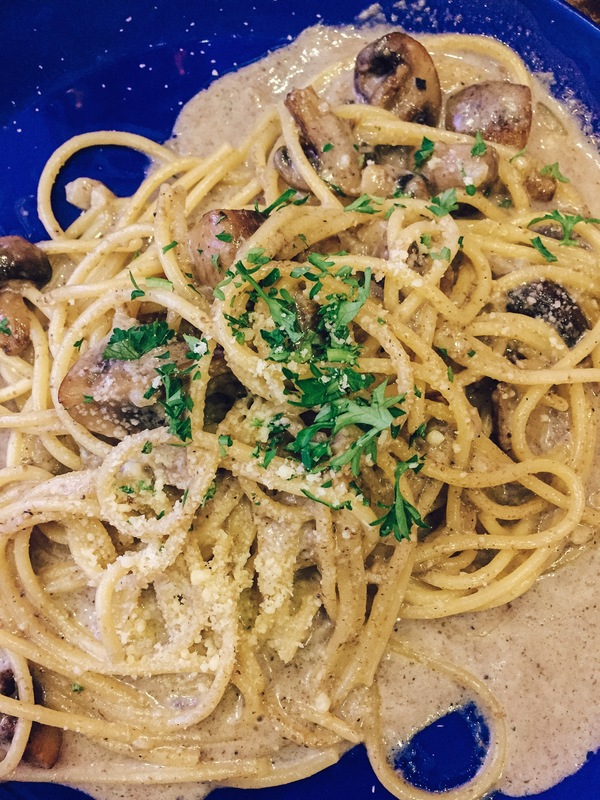 The pasta is al-dente, and the mushroom truffle sauce is so good! this one taste just right, where some of creamy sauce makes you sick if you eat too much. Overall, we had a good eating experience here! Good food with friendly price. Does’t matter how many times that you have visited Bali, this island seems always have something new to offer. 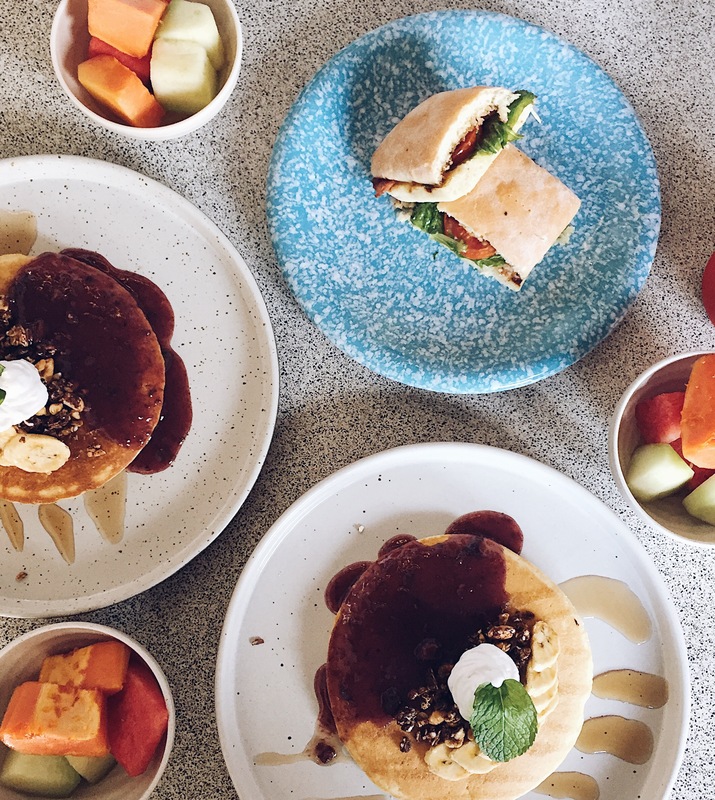 Like OMNIA – the new day club , Parachute – the latest cafe in canggu, Wasabi – the new pork skewer stall in town, and Cara-Cara INN – the cutest and instagramable hotel ever in Bali! I’m pretty sure that you have seen this photogenic corner! Well, i dont know about you, but when i first saw this corner on someone’s instagram, it makes me curious how does the entire place look like. Like you are in some hairspray movie.. haha. and so, since i got the opportunity to stay here during my last trip. im gonna show you every cute corner that they have! *grin in excitement! and Ohh.. Btw, you can really use that washing machine! Let’s start with their lobby + check in desk. 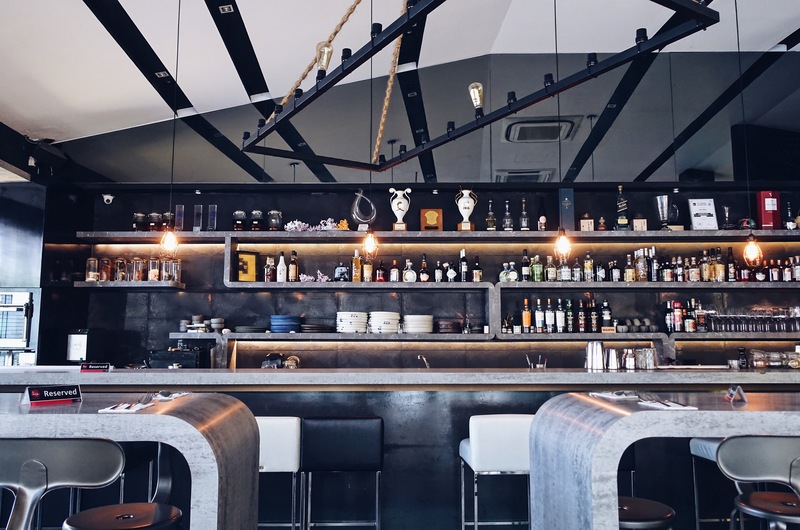 Unlike hotels, where you can feel the full blast air-con when you enter their place, Cara-cara inn has an open concept lobby. I was expecting at least a standing air-con, but there’s none. haha. *a city girl problem. But I have to admit that they have a good air-circulation that makes it not humid and hot, despite the scorching sun outside. I love the front-desk, it feels like you’re buying a movie ticket back in 70s, isnt it? and after you checked-in, They will pass you a unique roomkey that looks like a watch in green popping colour, which you can wear it anywhere without thinking you might have misplaced it. super unique! too bad i forgot to take its picture. after we check-in, we went right in to our room! and we present you, ‘The Blockbuster; room! This is an ideal room for two or three people with a queen bed and single loft, with the option for a 4th person. I have to say Cara-Cara inn loves bold colour block, that makes a fun vibrant ambiance yet comfortable to stay at the same time. I love how the design the room too! The summer vibe colours, and i think it’s very creative to make a bunk-bed up there and put the bean-bag as the living room. Overall, i just love the layout of this room. Spacious yet compact at the same time. As you can see from the room, Cara Cara wants to utilize the best of it’s space. So, they use their lobby as their breakfast lounge as well. And i have to compliment that they have a systematic ways to accommodate all the hungry guests. you’ll be given a coupon, and you have to decide during the check in time between the 4 options that they offer. During the breakfast, you just need to pass that coupon to the waiter, and you’ll be given a Q number. When your’s is up, you just have to take it from the counter, and enjoy it where ever you want, just dont forget to put the tray back to the allocated place. 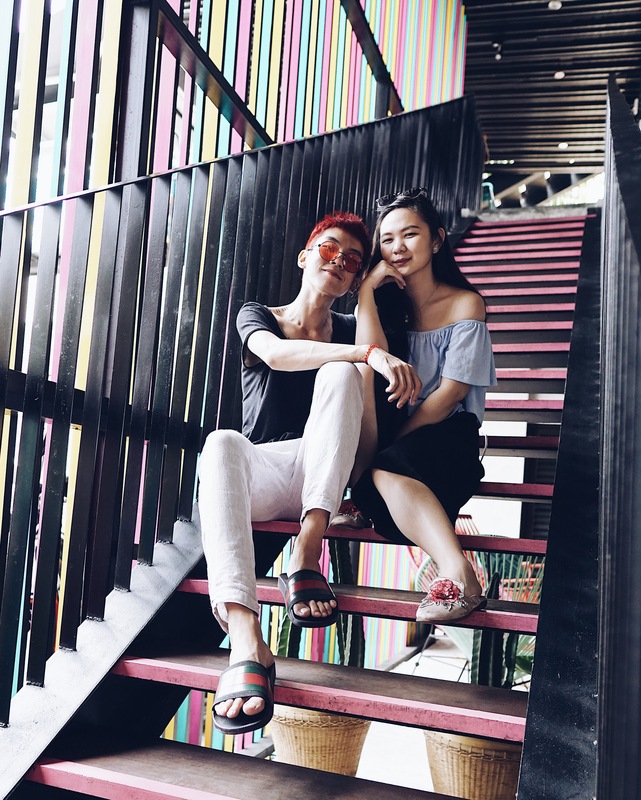 Cara-Cara has a lot of cute hang-out space, if you love to take pictures and chill at the same time, this might be a perfect place for you. Well, overall the place is not that spacious like other fancy hotels. You may have to take turns if you want to chill on the hammock, seat on the big cool sofas by the pool. But if you want to find something different and fun, you can consider this place as an option. So, what do you think people? Have you plan your getaway for Lebaran holiday? I was in Singapore last month for work. 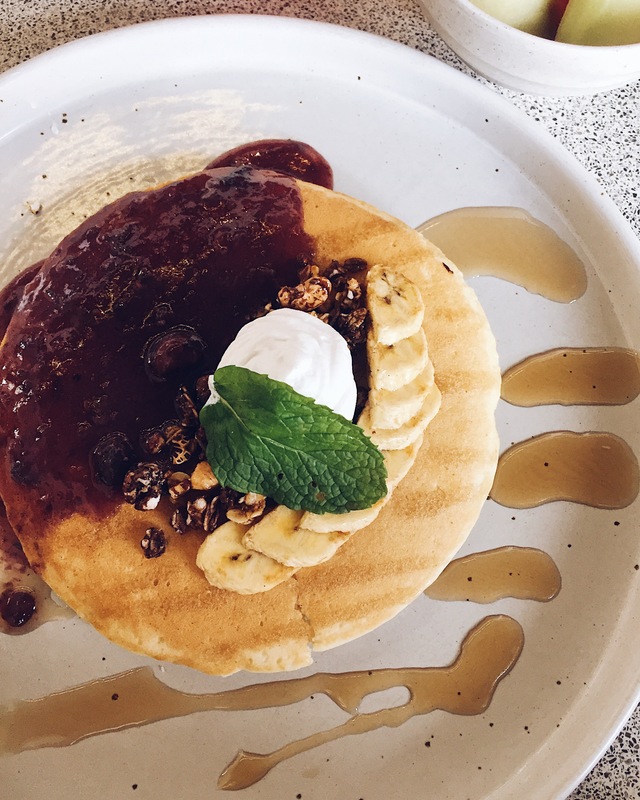 Since i love to try new things, I used my free time to catch up with few friends and try a few cafes that we never been to. 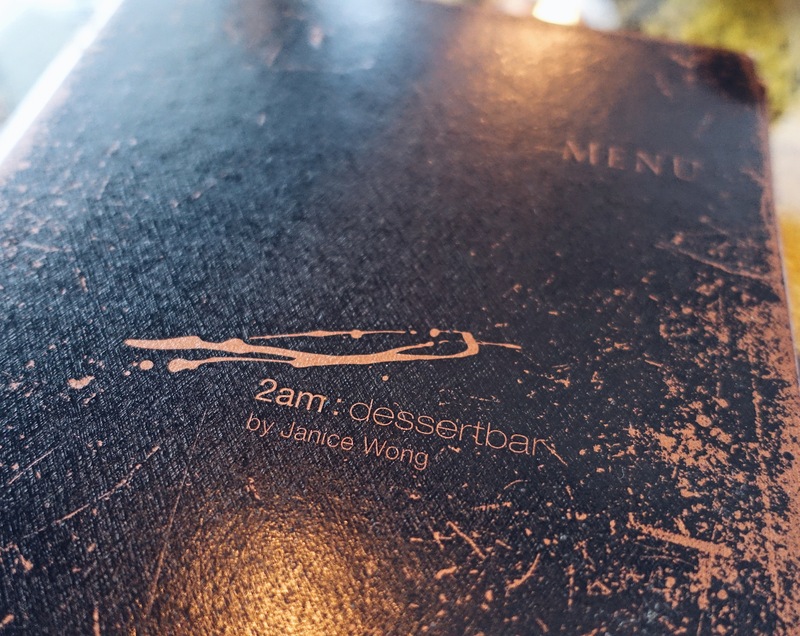 And one of it is 2am Dessert Bar by Janice Wong. Well, actually a chef friend of mine is the one who asked us to go to this place. He needs to find some inspiration, he said. and so, we went there in the afternoon, right after our Padang lunch. haha.. Yes, i lovee Singapore Padang food, somehow it taste nicer than Jakarta. i dont know why though.. haha.. maybe it was my comfort food back there. When we first entered the cafe, i thought we were entering some night club. haha.. They are located at the second floor, and we have to take the stairs with almost no light at the staircase. No wonder they called it a dessert BAR though. This is a perfect place for you who love to try those dessert that you can only see at ‘Master Chef’s show’ haha. 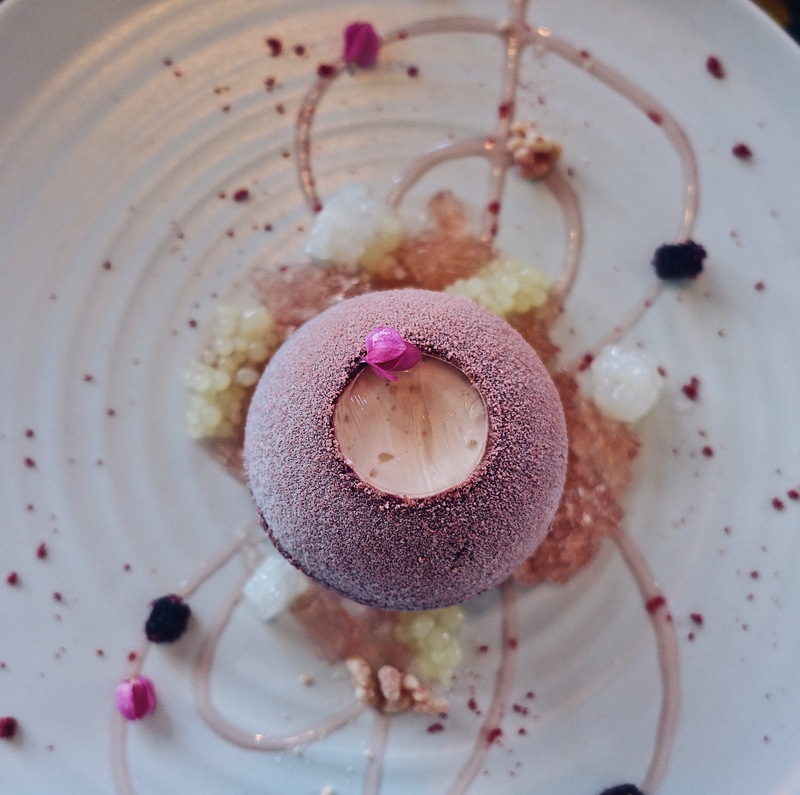 some pretty dessert that is called ‘Molecular Gastronomy’. 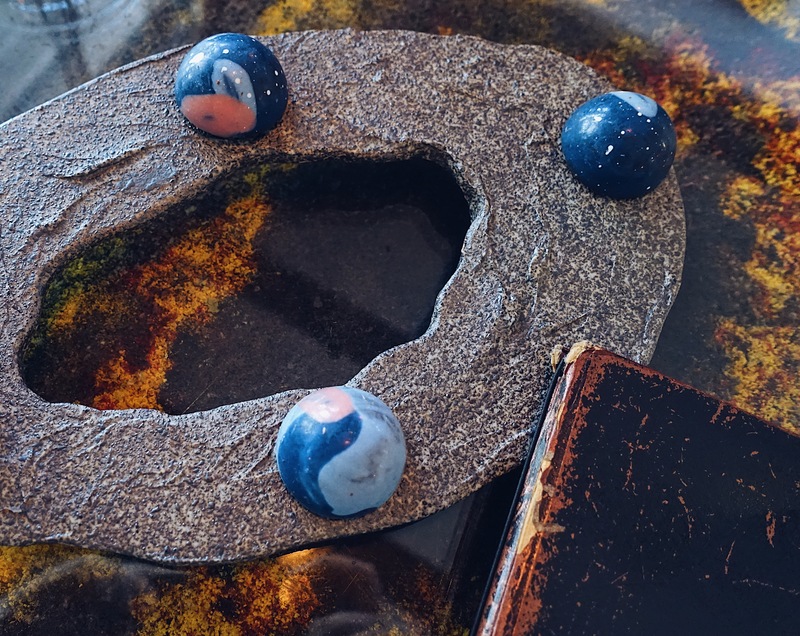 So, we got this this cute astronomical chocolate for the welcome dessert. and look how they plate it! it feels like the whole galaxy is on the table. We ordered 3 fancy desserts that day. The first one is , Shades of Green. 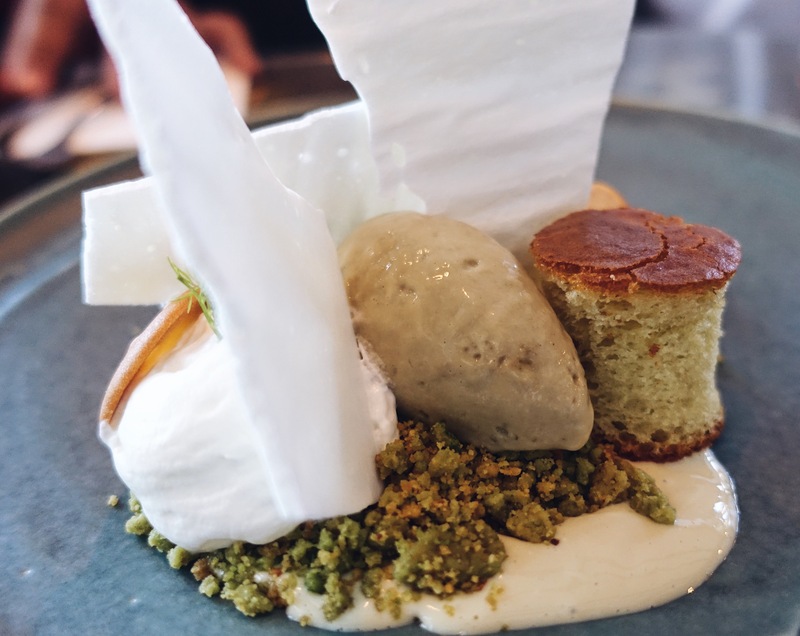 which consist of Pistachio Sponge. A tender and soft, but too little for us tho. Haha.. Accompanied with Coconut Mouse, which is a little to sweet for me, and tasty Pandan Ice Cream! with Pistachio crumbs. We think this is the most edible and a nice dessert combination. 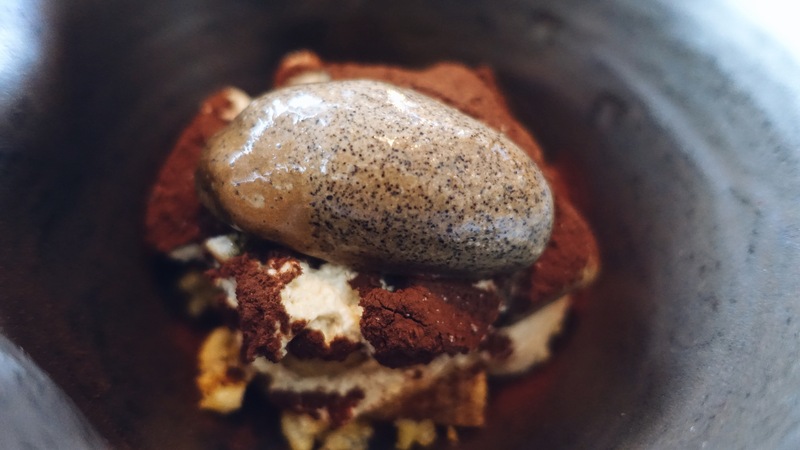 The second one is Tiramisu with Kahlua Jelly, Espresso Ice Cream. It came in one huge bowl, which make us the non-photographer confused on how to capture it. Duhh.. so, it was the less photogenic dessert of the day. I have to say that it was the most normal dessert. The safest choice of all.. hehe.. and speaking about Tiramisu, i guess those in Da Paolo is more worth it compared to this one. And The third one, which is the prettiest of all, is Cassis Plum. 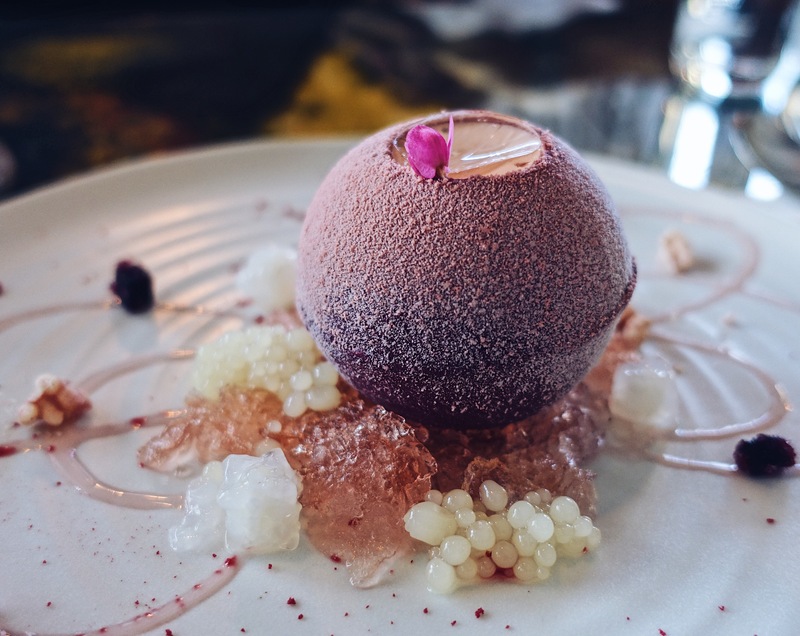 It consist of Cassis Bombe, Edelflower Yoghurt Foam, Choya Granita, Yuzu Pearls, Yuzu Rubies. As for me, everything is too sour that i cant enjoy it all. =(.. but loving their Yuzu Pearls and rubies. I have to say that Janice Wong bring all dessert to a whole new level! 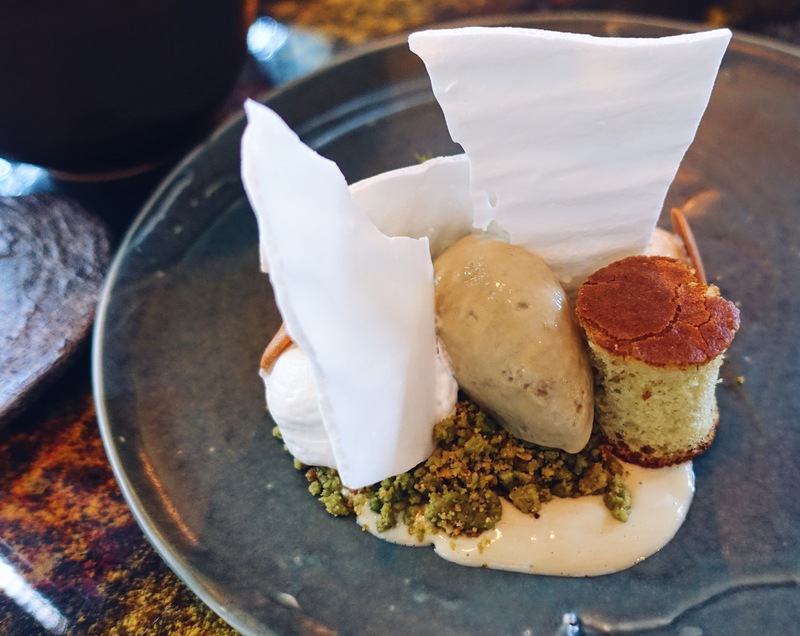 All dessert seems like an art, they accurately put everything in it’s place. Which makes you feel guilty if you ruin the art by eating it. haha.. This 2am dessert bar is a little pricy. 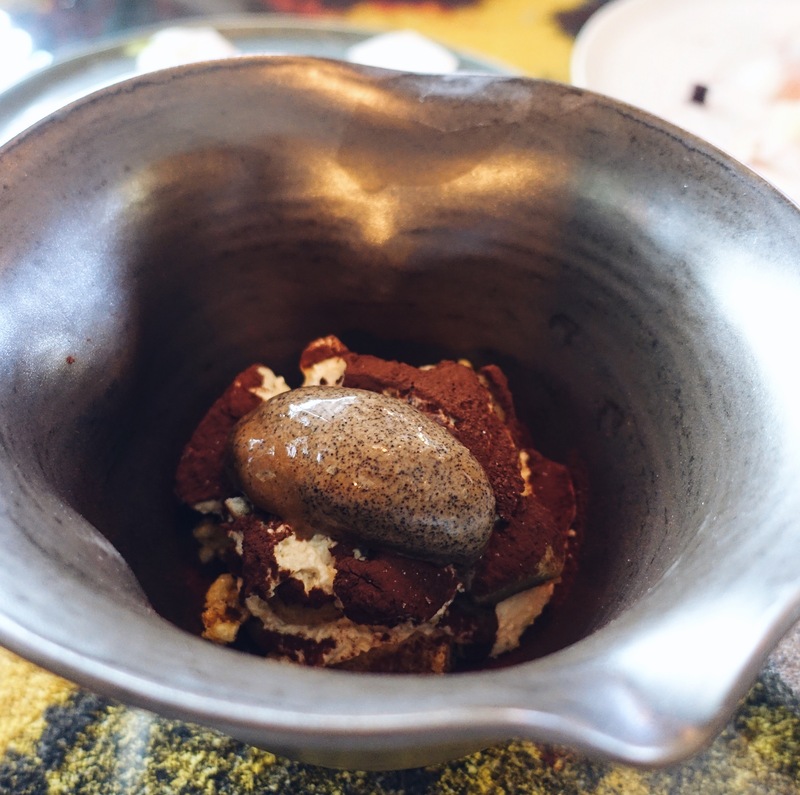 but i guess it is worth the try, more over if you are a gastronomy enthusiast!